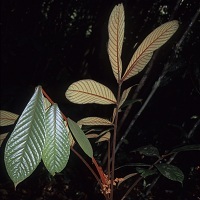 The genus Aglaia (family Meliaceae) is the largest genus in the mahogany family, with about 120 species. It occurs in the tropics of S.E. Asia from Sri Lanka and India, through Burma, S. China and Taiwan, Indochina, Malaysia, Indonesia, the Philippine Islands, New Guinea, Solomon Islands, Vanuatu (New Hebrides), New Caledonia, Australia (Queensland, Northern Territory and Western Australia), Fiji, as far east as the island of Samoa in Polynesia and north to the Marianne Islands (Saipan, Roti and Guam) and the Caroline Islands (Palau and Ponape) in Micronesia. A molecular phylogeny has demonstrated that the genus is divided into three sections, section Amoora, section Neoaglaia and section Aglaia. They are distinguishable morphologically, mainly on fruit characters and numbers of flower parts (Muellner et al 2005). 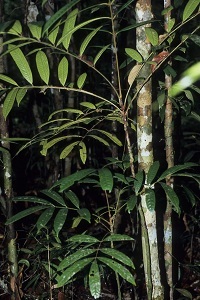 Species of Aglaia are common in the rain forests of SE Asia, with a dozen or more different species coexisting in single sites in Malaysia and Indonesia. The timber of many species is used locally for house-building, fence-posts, canoes, paddles, axe-handles, spear-shafts, firewood. 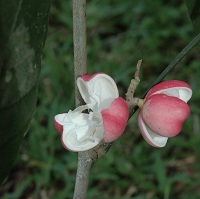 The fragrant flowers are used for scenting tea and perfuming clothes. They produce sweet, fleshy fruits which are cultivated in villages in Thailand Peninsular Malaysia and are eaten in the forest by indigenous forest peoples. The fruits of Aglaia are a source of food for bird and mammals in the forests of the Indo-Malayan and Australasian regions where they occur. Pannell and Koziol, 1987, describe most of our current knowledge of dispersal and aril biochemistry. In West Malesia, the fruits of section Aglaia are indehiscent and primates break open the orange, yellow or brown, fibrous, inedible pericarp and extract the one or two seeds from within. The translucent, sweet aril adheres firmly to the seed, and the seed is often swallowed whole. Analysis of the nutrient content of the aril reveals that it contains sugars and sweet-tasting amino acids and it is thought that these are attractive to the gibbons which disperse the seeds. The fruits of section Amoora and Neoaglaia are dehiscent and contain up to three seeds. The outer pericarp is pink or reddish-brown and contrasts with the white inner pericarp and the red aril surrounding the seed. The aril is easily detached from the testa and is removed by the action of a bird's gizzard, without destroying the rest of the seed. The aril, surrounding a relatively large seed, is rich in lipids and provides the birds which disperse the large seed with a high-calorie reward. The enormous seed of Aglaia mackiana, endemic to New Guinea, is consumed by the large flightless bird, the Dwarf Cassowary (Mack, 1997). Certain species of Aglaia have traditionally been used for their medicinal and healing properties (such as the treatment of fever, diarrhoea, inflammation and wounds). Extracts have also been used as bactericides, insecticides, and in perfumery. During the last 25 years, Aglaia been found to be the only source of the group of about 50 known representatives of compounds that bear a unique cyclopenta[b]tetrahydrobenzofuran skeleton. 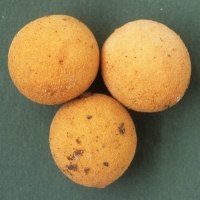 They are commonly named after the parent compound, rocaglamide, which was first described in 1982 (King et al., 1982). This is one of the few recent examples of the discovery of a completely new class of plant secondary metabolites of biological promise. Rocaglamide derivatives, or flavaglines, and biogenetically similar compounds from the genus Aglaia, have a range of bioactive properties. With a few exceptions, all naturally occurring rocaglamide derivatives exhibit striking insecticidal activity against various pest insects (King et al. 1982, Janprasert et al. 1993, Molleyres, Kumar 1996, Brader et al. 1998, G. Bringmann et al. 2003, Koul et al. 2004). Fungicides which are highly active against the rice blast disease, Pyricularia grisea, have been isolated from Aglaia species; the most potent being the flavagline rocaglaol (Engelmeier et al. 2000). Platelet aggregation inhibitory effects (Ko et al. 1992), antiviral (Joshi et al. 1987), antibacterial (Kakrani and Nair 1982) and anthelmintic bioactivities (Kakrani and Nair 1982) have also been reported for the genus. Perhaps most promising of all, rocaglamide and several of its congeners display pronounced cytostatic activity against human cancer cell lines in vitro (King et al. 1982, Mata-Greenwood et al. 2001). It has been demonstrated that they inhibit NF-KB induced gene activation in human T cells (B. Baumann et al. 2002) and are able to elicit apoptosis in resistant tumor cells (B. Hausott et al. 2004). There are at least nine patents for compounds with anti-cancer properties isolated from Aglaia (and one for insecticidal properties). Hwang et al. (2004) have demonstrated that silvestrol (a new analogue in this series) is potently cytotoxic for a small panel of tumour cell lines (comparable in potency with the standard agents, paclitaxel and camptothecin) and is active in the P388 lymphocytic leukemia model in vivo. (Su et al. 2006) have also found that rocaglaol is cytotxic for several human cancer cell lines. There have been reports that rocaglamide derivatives could serve as lead structures in the development of anti-inflammatory (Gehling et al. 2003) and tumoricidal drugs (Baumann et al. 2002). The chemistry and biology of rocaglamides and other compounds extracted from Aglaia was reviewed by Proksch et al. (2001). He states that, in addition to rocaglamides, some Aglaia species contain biogenetically similar natural products of the aglain, aglaforbesin or forbaglin type. These compounds (which differ from rocaglamide and its congeners mainly by the nature of their heterocycle), seem to be devoid of significant biological activity of the type summarized above. This led him to conclude that the cyclopenta[b]tetrahydrobenzofuran core of the rocaglamide skeleton is an essential structural requirement for the pronounced biological activity of the rocaglamides. These compounds and their derivatives therefore seem to be candidates for the development of new drugs, primarily in the field of cancer chemotherapy. They have also attracted the interest of synthetic organic chemists as target compounds (e.g., Gerard et al. 2004; Thede et al. 2004). The importance of voucher specimens and correct naming for communication of phytochemical findings Harald Greger, Brigitte Brem and their co-workers have isolated many of the bioactive compounds known from Aglaia. In the course of their work they have encountered and recognized the taxonomic problems of the complex species in Aglaia, which can result in confusion in the chemical and pharmaceutical literature. They have relied on expert identification by Caroline Pannell of sterile collections from juvenile plants and have therefore attributed the correct name to most of the species from which they have isolated bioactive compounds. To ensure that any changes in the naming of species can be linked to novel compounds which they have extracted and described, they have cited voucher specimens (deposited in the herbarium of the University of Vienna, WU) in all of their papers. A database of their specimens is included on this website. Published reports of compounds isolated from Aglaia are frequently attributed to the wrong species. This makes it difficult to compare the results of the different research groups, to replicate their work or to collect more plant material for additional extracts. If a voucher specimen is cited, and the specimen is obtainable on loan from the institution where it is deposited, an accurate identification can be made. The discovery of the new chemical can then be attributed to a species, for which frequency, distribution, and taxonomic status are already documented. Contribution of phytochemistry and DNA analysis to the taxonomy of Aglaia Understanding of the taxonomy of individual species, of groups of species and relationships between species groups can also be refined in the light of the new information provided by investigation of the phytochemicals they contain. Preliminary work combining into a systematic framework data from morphological characters, phytochemicals and nucleic acids has already been published (see Muellner et al. 2005). Some groups of species, earlier identified from their morphology and confirmed by molecular methods were found to be characterized by separate groups of chemicals. Such knowledge can be used to target species groups likely to yield new analogues of the bioactive compounds. The database of herbarium collections made available in BRAHMS online includes many of the specimens on which the monograph and flora accounts have been based. The size of the genus (approaching 120 species) and the existence of a monograph of the entire genus make it a suitable subject for investigations which require a large genus in which accurate identification of specimens can be achieved. A new class of chemical compounds, discovered in Aglaia in 1982, have made it the subject of numerous phytochemical and pharmaceutical investigations. Aglaia densisquama collected here in Malaysia by Caroline Pannell.